In the automobile industry, modern systems of speed regulation (e.g., adaptive cruise control (ACC)) aid the driver and lead to significant improvements in driver safety and comfort. The common German term is distance-regulated cruise control. With this system, the position and speed of the vehicle ahead is determined using a RADAR or light detection and ranging (LIDAR) based sensor by measuring the phase shift. A vehicle equipped with this adaptive cruise control system travels behind the vehicle being measured. The motor and braking systems intervene to adaptively regulate the speed and distance of the second vehicle (i.e., the vehicle with distance-regulated cruise control). In many vehicles today, the RADAR system is still being used as the primary measurement system because the LIDAR systems still malfunction too often when the weather conditions reduce visibility. The advantage of LIDAR systems is their price difference; LIDAR systems cost approximately 1/3 of RADAR systems. PLDs that emit at a wavelength of 850 nm or 905 nm are used together with PIN or avalanche photodiodes. This technology is also used by the police and communities to monitor traffic. Speeds up to 250 km/h can be monitored using ns pulses. 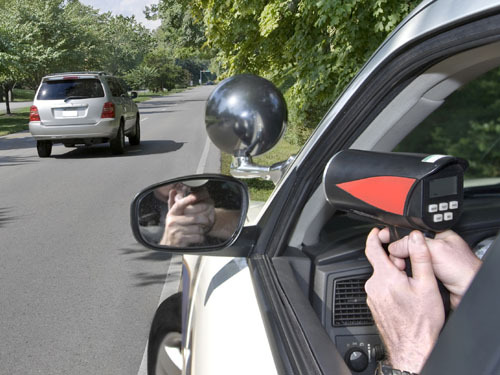 The distance between a fixed laser speed measurement system or a laser radar gun and a passing car can be as high as 1000 m. The speed of a car is measured at an accuracy of between one and three percent.